Leonardo Wilhelm DiCaprio is an American actor and film producer. DiCaprio began his career by appearing in television commercials in the early 1990s, after which he had recurring roles in various television series such as the soap opera Santa Barbara and the sitcom Growing Pains. In 1993, he began his film career by starring as Josh in Critters 3 . He starred in the film adaptation of the memoir This Boy's Life , and was praised for his supporting role in What's Eating Gilbert Grape . He gained public recognition with leading roles in The Basketball Diaries and the romantic drama Romeo + Juliet , before achieving international fame with James Cameron's epic romance Titanic , which became the highest-grossing film of all time until Cameron's science fiction film Avatar overtook it. Leonardo Wilhelm DiCaprio (/dᵻˈkæpri.oʊ/; born November 11, 1974) is an American actor and film producer. DiCaprio began his career by appearing in television commercials in the early 1990s, after which he had recurring roles in various television series such as the soap opera Santa Barbara and the sitcom Growing Pains. In 1993, he began his film career by starring as Josh in Critters 3 (1991). He starred in the film adaptation of the memoir This Boy's Life (1993), and was praised for his supporting role in What's Eating Gilbert Grape (1993). He gained public recognition with leading roles in The Basketball Diaries (1995) and the romantic drama Romeo + Juliet (1996), before achieving international fame with James Cameron's epic romance Titanic (1997), which became the highest-grossing film of all time until Cameron's science fiction film Avatar (2009) overtook it. Since 2000, DiCaprio has received critical acclaim for his work in a wide range of film genres. DiCaprio's subsequent films include The Man in the Iron Mask (1998), the biographical crime drama Catch Me If You Can (2002), and the epic historical drama Gangs of New York (2002), which marked his first of many collaborations with director, Martin Scorsese. He was acclaimed for his performances in the political war thriller Blood Diamond (2006), the neo-noir crime drama The Departed (2006), the espionage thriller Body of Lies (2008), the drama Revolutionary Road (2008), the psychological thriller Shutter Island (2010), the science fiction thriller Inception (2010), the biographical film J. Edgar (2011), the western Django Unchained (2012), and the period drama The Great Gatsby (2013). 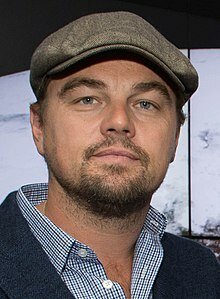 DiCaprio's portrayals of Howard Hughes in The Aviator (2004) and Hugh Glass in The Revenant (2015) won him the Golden Globe Award for Best Actor – Motion Picture Drama, and his role as Jordan Belfort in The Wolf of Wall Street (2013) won him the award for Best Actor – Motion Picture Musical or Comedy. He won his first BAFTA award for Best Actor for The Revenant. He has been nominated for six Academy Awards—five for acting and one for producing—and in 2016, he won the Academy Award for Best Actor for The Revenant. DiCaprio is the founder of his own production company, Appian Way Productions.